Christmas eve is not a public holiday here in the UK. Sure there are plenty of people with the day off but many of us still need to get to work on time. For the past few days the 7:44 has been advertised as having 8 cars then arriving with 4. The 7:18 has been cancelled the past 2 days. 7:32 was cancelled this morning and from memory its not the first time this week. 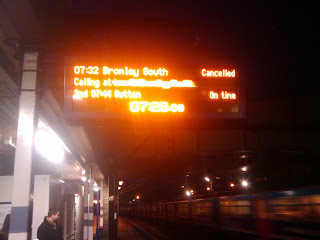 The 7:44 was advertised as being on time up until 7:45. Then suddenly its running 15 minutes late? Wtf?